That’s all she wrote for tonight! Zhi Ma is our flight 3 chip leader, having stacked 203,800. We had 182 players take their seat today with exactly 100 busting to leave us with 82 remaining. That means that there are 166 players through to Day 2, with the top 5 stacks from flight 3 below. Join us from 12.30 tomorrow as we bring you all the live action from Day 2 of the Australasian Poker Challenge Main Event! The tournament staff have called three hands to go tonight! Reza Vakili has moved to 80,000 after knocking out an opponent. After a late position shove, Vakili re-shoved with AQ and was in a dominant position against AT. The board ran out 48856 as the field drops to 84 remaining in today’s flight. he final field of 192 runners today means our tournament total is 444 players. There are currently 93 players remaining in today’s flight. Players are back for the final level of the day with blinds at 600/1,200 with a 100 ante. Players are now on their final break for flight three, one last hour level awaits them before progressing into day two. A poker players worst nightmare has just been witnessed after an all in call center pit saw two players peel over pocket AA’s. UKA holding A♣A♠ and Jordan Westmorland holding A♦A♥ with the board running out Q♥8♥7♦4♥6♥ for a four card flush eliminating UKA and sending Jordan to over 135,000! With 192 starters here for flight three, we are nearing half of the field with just over 100 indicated runners remaining. Blinds have increased to 500/1000 with a 100 ante, this will be our 2nd last level for tonight. Shivan Abdine involved in a 4 way pot leading out 2700 only to be raised and re-raised all in on the flop, layong it down his opponent makes the call and the all in player peels over A♣10♣ on a 6♥2♣Q♣ board. The turn a 6♣ giving the all in player the nut flush and doubling his stack, Shivan sitting on upwards of 45,000. Jonathan K moving ahead after elliminating a player with pocket JJ’s, Jonathan now sitting with over 130,000. All green chips are currently being removed via a chip race on each table. Players have taken their seats with blinds recommencing at 400/800 with a 100 ante. 14 tables remain in play from 192 tecorded entries into flight three so far. Nursing a fairly short stack Con Angelakis gets his chips in with pocket KK’s recieveing one caller with AQ pre flop. The Board no help for his opponent he rakes in the pot of around 49,000. Blinds are now 300/600 with a 75 ante. Daniel Neilsons day 2 hopes have been crushed after running his pocket KK’s into pocket AA’s. Although reporting him making day two, catching up with neilson confirmed he actually busted in the very last hand last night in flight two. Jim Lin in control sitting on 119,000. 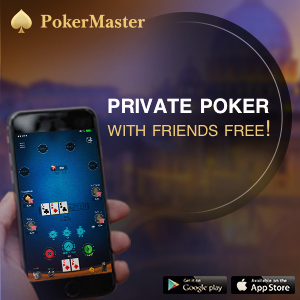 Currently 16 tables remaining in play from 187 starters so far. Michael Seymour was quick to get it in with 88 on a J83 flop, but ran into the pocket Jacks of Michael O’Grady. Seymour makes an unlucky exit while O’Grady is up to 65,000. The field has grown to 186 starters today with recent arrivals including Alex Lynskey, Angelina Rich, Tam Truong and Minh Nguyen. Peco Stojanovski opened to 900 and Tolly Sakellariou called. Michael Addamo then 4-bet to 4,000 with only Sakellariou calling. The flop came AQQ and both players checked. On the 3 turn, Sakellariou check-called a bet of 3,800 from Addamo before both players checked down the 7 river. The cards were rolled over and Sakellariou took it down with AK to Addamo’s AJ. Sakellariou is firing his third bullet today but has started well with a stack of 65,000. Players are back to find blinds at 200/400 with a 50 ante. Players are now on a 20 minute break. As we approach the end of Level 4 and the second break of the day, the field has swelled to 182 starters – taking the total size of the Main Event field to 434! Jonathan Karamalikis has enjoyed tremendous success here at The Star, having won the APPT Sydney Main Event in 2010 for around $450,000 and a couple of High Roller events for almost $200,000 combined. He hasn’t had much luck this week though and is back to fire his third bullet of the Australasian Poker Challenge Main Event after busting flights 1 and 2. He is currently sitting just above his starting stack of 30,000. Zhi Ma has just enjoyed a nice boost to his stack after a clash with Laurence Hall that ended with Hall being sent to the rail. In a 3-bet pot pre-flop, hall bet out on a 7♠6♦4♠ flop and Zhi made the call. The turn was an A and this time Hall shoved. Zhi called to show A♠2♠ – well ahead of Hall’s K7. No miracle arriving to save Hall on the river and he hit the rail. David Sebesfi has been gradually clawing his way back after a slow start to the day’s play. Down to 7,000, he is back up to 21,000 and climbing. The early stages of any tournament can be a little slow at times, but fortunately our reporting desk has prime position here in The Star’s temporary poker room. Seated alongside the large floor to ceiling windows next to Cherry bar, we’re enjoying lovely views out over Sydney Harbour where the weather today is nothing short of glorious! Blinds are now at 150/300 with an ante of 25. Jimmy Ghobrial was one of the big stacks last night until a huge clash with David Sanis ultimately led to his demise. He is back again today trying to get started again but hasn’t started too well. He just won a handy pot from Tom Rafferty however to keep the dream alive. We caught the hand on the turn with Ghobrial betting 3,500 on an A972 board. Rafferty called to see a repeat A on the river. Ghobrial shoved for his remaining 4,200 with Rafferty tank-folding. Nicola Kramer taking full advantage and eliminating a player holding pocket 5s after his pocket 9s flop middle set, moving him up to over 45,000. Our early chip leader Steve Pappas has been joined at his table by Laurence Hall, so there is plenty of chatter going on. 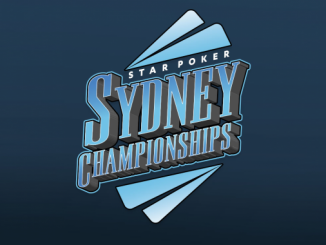 Pappas is a regular here at The Star and it is famously rumoured that he was out in 6th in the 2014 Sydney Championships Main Event! Players have returned from their first break of the day with blinds now at 150/300. Players now on their first break of the day and will return in 10 mins. “AJ” Antonios has moved to 60,000 early on thanks largely to a recent pot in which he gained three streets of value holding AK. Sammy Lucisano opened UTG to 450 and another player called before Antonios 3-bet to 1,900. The flop fell A94 and AJ bet 2,300. Lucisano called. The turn was a repeat 4 and this time Antonios bet 6,500. Lucisano called. When a 7 landed on the river, Antonios fired 13,500 and Lucisano called again, only to find his AJ well beaten. Peco Stojanovski eliminates a player after calling his opponents all in on the turn. Tabling K6 on a K967 board his opponent with only a pair of 9’s needed help on the river that never came, Peco now upwards of 65,000. Total runners now totalling over 410, play is nice and slow as expected, we are in for a long day. There are currently 153 players registered for today’s flight, taking the total number to 405 for the tournament. Registration is still open for another four levels after this one so expect that figure to keep moving north. Steve Pappas, or Yoda as he is known to his mates, has scored an early double up and eliminated an opponent in the most remarkable of fashion. Pappas picked up KK and 3-bet an early position raiser only to face a cold 4-bet to 6,000 from another opponent. Pappas called and they saw a 10-high flop. With that, Pappas shipped but was snap-called by his opponent with AA. Pappas was on the brink of elimination, but conjuring all of his Jedi might he managed to change all that as a K landed on the turn – Yoda scoring a spectacular double to move to 60,000 within the first 30 minutes! Jonathan Karamalikis, Tom Rafferty. Michael Kanaan, Ali Ghezelbash, Vince Chua, Michel Bouskila and Steve Pappas are also here. There are already 132 players registered for today’s flight, which means just 16 more are needed to crack 400 for the tournament. Expect that number to be easily eclipsed. 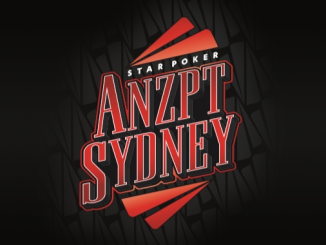 Plenty of names early on – Alexander “AJ” Antonios, David Sebesfi, Peco Stojanovski, Sam Capra, Jim Psarosm Sheldon Mayer, Manny Stavropolous, Nick Polias, Luis Arrilucia, Jarryd Godena, Shivan Abdene, Dean Yuen, Michael O’Grady and Patrick Fletcher are among the players seated so far. Play has commenced here for day three with blinds starting at 50/100. The first two flights have seen 252 players take their seat with a touch under 90 having progressed through to Day 2 so far. That number will rise today though with the biggest field yet expected to swell the final field for the Australasian Poker Challenge main Event well over 400.